← Frugal Food reinvented for the Credit Crunch ? Slice mushroms and sautee in a little butter until soft and starting to turn golden brown, sprinkle with plain flour, salt & pepper, fry off for about a minute then add a little milk & stir, keep adding a little milk until sauce has reached your desired consistency. Toast & butter 2 slices fresh bread (I used Warburtons Blackpool Roll!) 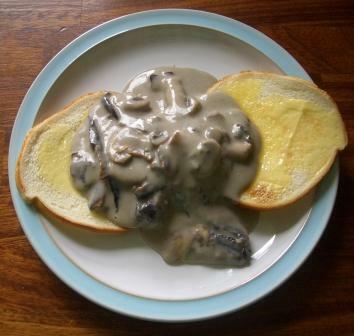 and pour creamed mushrooms over and enjoy…. This entry was posted in Eating, Food, Yorkshire Dales Food and tagged blackpool, butter, creamed, lunch, milk, mushrooms, roll, simple, toast, warburtons. Bookmark the permalink.